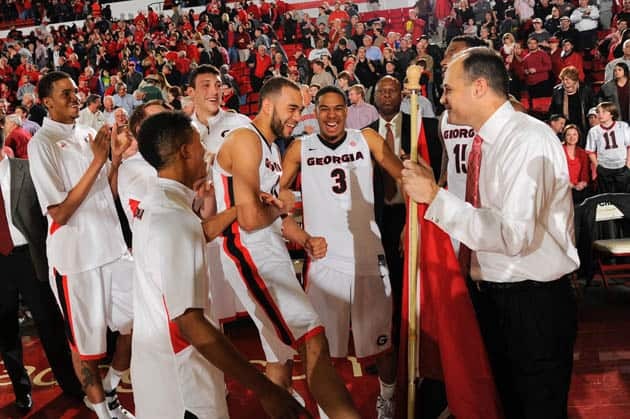 ATHENS, Ga. – Georgia claimed sole possession of third place in the Southeastern Conference with a dramatic 61-60 win over Ole Miss on Saturday evening in Stegeman Coliseum. A Charles Mann free throw with just 1.5 seconds on the clock saw Georgia win its fourth straight game and run its record to 14-10 overall and 8-4 in the SEC. Georgia was led in scoring by Kenny Gaines who tallied 21 points for the Bulldogs including 19 in the second half. Mann had 17 points for the home team. Marcus Thornton was the top Bulldog in the rebounding category as he grabbed 11 boards, his third double-digit effort of the season. The dramatic sequence that saw Mann at the charity stripe with one and a half ticks left on the clock saw the Bulldogs gain and lose the lead multiple times in the last three minutes. Gaines, who hit 5-of-8 3-pointers in the second half, sunk potentially his biggest with 47 seconds left on the clock as he put the Bulldogs up 60-57. A Jarvis Summers 3-point play pulled the Rebels level with 33 seconds left before Mann dribbled the clock down to its final stroke. As the point guard drove to the basket he was fouled by Ole Miss center Dwight Coleby and stepped to the line. After missing his first attempt, Mann knocked down the second and put the Bulldogs ahead for the final time. Georgia started the second period as it finished the first, finding an early offensive rhythm that carried them to a 30-30 tie with 17:31 on the clock after a Kenny Gaines 3-pointer. After falling behind by three again, Gaines pulled out another shot from well beyond the arc to bring the Bulldogs level at 37-37. Georgia pulled ahead at the 11:24 mark as Gaines made the score 41-40 with a four-point play after being fouled on a speculative 3-point field goal. From that point Georgia would go on a 13-0 run the lasted from the 11:24 mark until 8:07 left in the game. This stretch was highlighted by Gaines’ 3-point shooting and an athletic alley oop finish from Donte Williams from a Juwan Parker assist. Gaines’ 19 second period points led the Bulldogs while Thornton collected seven second stanza rebounds to pace the team in the final period. Georgia went ahead early as Charles Mann found nothing but net on a straight away 3-pointer gave the Bulldogs an early 3-2 lead. However, Ole Miss’s Marshall Henderson found quickly found his range from deep as he hit three quick 3-pointers to put the Rebels on top 14-9. The Bulldogs struggled throughout the first half with turnovers as they turned the ball over five times in the first 12 minutes of action. Another Henderson 3-pointer pushed the Rebels lead to double-digits at 26-15 before the Bulldogs went on a 7-0 run over the next 1:26 to trim the deficit to four points. Two Ole Miss free throws pushed the lead back to six before a Mann pulled a point back for Georgia from the line. The half finished with the visitors ahead 28-23. Mann led the Bulldogs in the first stanza with 10 points thanks in part to his five free throws. Mann and Thornton led the home side on the glass as they grabbed four boards each. Georgia returns to action on Tuesday as the Bulldogs begin a two game road swing travelling to Knoxville, Tenn., to face Tennessee before heading to Columbia, S.C., for a return date with South Carolina. The games will be televised by ESPNU and SEC TV respectively. The Bulldogs return home for the penultimate time this season on Feb. 25, as they welcome the Missouri Tigers to Stegeman Coliseum. The game will be televised live by ESPNU. Single-game tickets are on sale via georgiadogs.com, by calling 877-542-1231 or in person at the UGA Ticket Office in the Butts-Mehre Heritage Hall from 8:30-4:30 on weekdays. · Georgia’s starting line-up was Marcus Thornton (50th career start), Brandon Morris (35th career start), Charles Mann (30th career start), Kenny Gaines (22nd career start) and Donte Williams (82nd career start). · The one point win is Georgia’s smallest margin of victory this season. · Ole Miss’ three turnovers were the lowest by a Bulldog opponent this season. · Georgia outrebounded Ole Miss 49-34 and improved to 14-3 when outrebounding opponents this season.